Spontaneously store in style with the Impromptu Personal Mobile Storage Center. 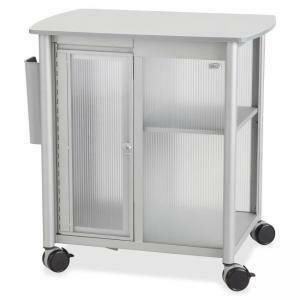 This versatile, mobile cart gets the job done for a spur-of-the-moment project or everyday storage needs. Easily fit it under your desktop to keep active projects within easy reach. Convenient bin on the side is perfect for hot files or daily paper recycling. Store personal items behind a locking door in the generous open space (10" wide x 13-1/2" deep x 21" high) that fulfills any storage need. Top open compartment (12" wide x 8-3/4" deep x 9-3/4" high) provides additional storage. Bottom open compartment (12" wide x 10" deep x 11-3/4" high) is perfect for binders. Use the melamine top with gray laminate finish to keep equipment handy. Weight capacity is 200 lb. Design also features alluring polycarbonate panels and powder-coated, gray steel frame for durability. Four 2-1/2" diameter swivel casters (two locking) deliver easy mobility and stability. Cart includes two keys for the door.